Though Côte d'Ivoire has officially been at peace for over two years, many of the nearly 60,000 refugees who remain in Liberia are settling in for the long haul, citing continuing instability, violence and fear of political persecution in their home country. Indeed, two years after the end of the conflict, camps like PTP, near Zwedru in eastern Liberia, are still growing. At 3am on the 21 March 2011 rebel fighters affiliated with the current Ivoirian president, Alassane Ouattara, overran the town of Blolequin in western Côte d'Ivoire. Among the thousands who fled in the early hours of the morning, most with little more than the clothes they were wearing, was Gibao Jerome. His younger brother was killed during the escape as he and his family trekked for two weeks through the forest to become refugees in eastern Liberia. Two years on, they have no intention of returning home. "This is my house, number B3-1," said Gibao, gesturing to a small structure of mud, sticks and tarpaulin in the monotonous grid of PTP camp (formerly the Prime Timber Production company). Once a simple white tent provided by the UN Refugee Agency (UNHCR), Gibao's house is slowly becoming a home. Piles of construction materials lie in a small extension at the front, as he talks of his plans to shore up the building. The problem, Gibao told IRIN, is that western Côte d'Ivoire remains unsafe for supporters of ex-president Laurent Gbagbo - who awaits trial by the International Criminal Court in the Hague - or anyone from the Guéré ethnic group, among others. He and many other refugees cite post-conflict justice as having been one-sided, and he points out that instead of disarming the rebel forces, many of them (also responsible for atrocities in the west of the country) now effectively form the national army. "When you go back, they will say "this man voted for Gbagbo'," said Tahr, another refugee who fled the March 2011 attack on Blolequin. His neighbours chip in with stories of returnees who were imprisoned or killed by `the Burkinabés', as the alliance of northern pro-Ouattara groups are generically known by the Guéré. Underlying the animosity is the long-running conflict over land. Post-independence president Félix Houphouët-Boigny, during his three decades in power, promoted a policy of inclusion, encouraging migrant workers to Côte d'Ivoire's rich cocoa plantations. After his death in 1993, successive regimes have used ethnicity as a political tool, stirring up ethnic rivalries and igniting underlying tensions. "The Burkinabés have guns, and when they see you they get rid of you to take your land," said Gibao, whose wife, Victoire, said her farm was taken away from her. Many feel that members of the northern and migrant groups used the conflict to drive away local landowners and take over their properties. Burkinabés have lived in Côte d'Ivoire for many generations, yet are still treated by many Ivoirians as outsiders. 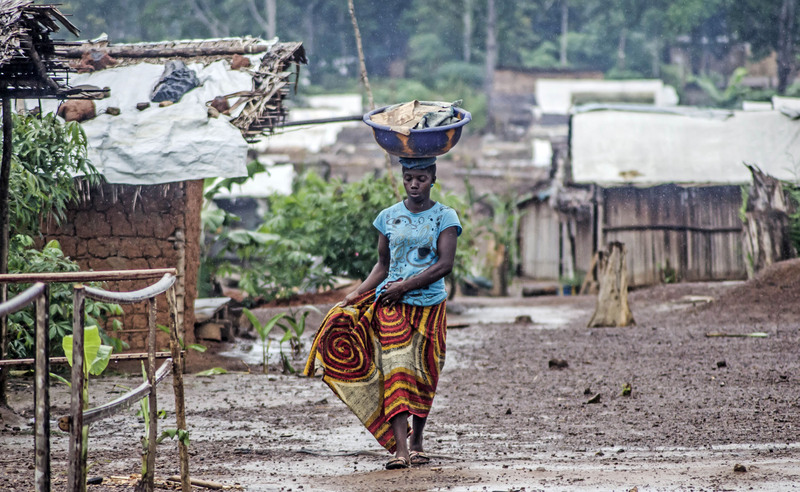 Some 100,000 Burkinabés in Côte d'Ivoire were pushed off their land and fled the post-election violence in 2010-2011. Repatriations are continuing, but slowly. All that they can hope for, say many of the remaining refugees, is that Ouattara loses the next general election in 2015. With this mindset, the refugee camps in eastern Liberia are slowly morphing into more permanent settlements. Lisa Quarshie, a UNHCR protection officer, sees PTP camp becoming more entrenched. "More and more people are daubing their houses with mud, and we're hoping to be able to get more resources to even give zinc sheeting for the shelters." UNHCR is also looking to increase efforts to create livelihoods in the camp, while basic services like schools have shifted from cramped tents to smartly painted concrete buildings. The refugees also have access to an on-site health clinic. Bahi Martine spent two weeks trudging through the forest to get to Liberia. Her brother was shot in the leg as they escaped, and four of those they travelled with were killed. For two weeks - without access to clean water - she made her children drink urine to survive. Now she has invested in a small restaurant at the front of her shelter in PTP camp, serving rice and cassava-leaf sauce to refugees on elaborate bamboo tables and benches. "I will never return to Côte d'Ivoire," she said. Another woman has started to make a living selling doughnuts to the refugees; while in a separate camp, UNHCR has supported the creation of a snail farming business. Across eastern Liberia, refugees are putting down roots and investing in their new lives. "You can't keep people in limbo," Quarshie told IRIN. "The least that we can do is to make sure that they have a dignified life here." One of the reasons the camp is growing is due to a Liberian government policy of encouraging refugees living with local communities to move into the camps. Initially, this was to help centralize services given to refugees who were scattered across the remote villages of eastern Liberia. At the UN office in Zwedru, Quarshie notes that the policy has its downside. "It's always better to live in communities, in the sense that you integrate faster... If you're in a community and you're not getting food from WFP, you're most likely going to find a piece of land and try and do some farming and feed yourself or your family. If you're in a camp. you then might become very dependent on food handouts. I think it has its advantages and it has its disadvantages - personal and physical security is better monitored than when you're in a community," she said. Wonsea Norbert is chairman of the Ivoirian refugees living in a mixed refugee and local population in Toe Town, near the border with Côte d'Ivoire. He said the refugees in the town are split on how to proceed. Living without any assistance has been tough, but Norbert says it is still better than moving to a camp. "We like to work on our own. In the camp you are tied - you cannot work," he said. Relationships with the local community are cordial. Some Toe Town residents, like Fasu Keita, were themselves hosted during Liberia's own conflict by the same Ivoirian families now residing in the town - and there is plenty of work to do. But without farming tools and a little seed-rice, they find it impossible to support themselves: the UN has stopped providing support to refugees who opted to stay in local communities. "They like to work on the farm for themselves," said Norbert. "But we have had no support. We can't support ourselves here." Despite the fear of reprisals in Côte d'Ivoire, some refugees in the town are now going home, preferring insecurity to the restrictions of camp life. "It was also the issue of security," said UNHCR's Quarshie. Amid continuing insecurity along Liberia's porous border with Côte d'Ivoire, ex-combatants now living in Liberia are seen as a potentially destabilizing force if allowed to roam freely in the settlements near the border. There are also concerns that the camps themselves, with their politically and ethnically homogenous populations of refugees, and the presence of ex-combatants, could become breeding grounds for anti-government movements. "As much as we are concerned, we do not expect that we have fighters in the camp. We may have ex-combatants. But as the name goes, they are ex-combatants. Yes, it could create problems if it's not properly managed, but I feel that so far it's been managed quite well," said Quarshie. None of the refugees spoken to by IRIN favoured the overthrow of Ouattara. Rather, with quiet resignation they look to settle into life in Liberia, and cross their fingers for the 2015 elections. "Until they are all gone," said Gibao "I can never go back."